As the temperature cools off, it's time to pull out your crockpot for this delicious, warm dessert. It's perfect for fall! What is your favorite thing about fall? It's our favorite season. There is so much to love: my daughter's birthday, color changing leaves, crisp air, apples, pumpkins, sweaters, holidays… you get the idea. It's definitely the time of year where my crockpot gets a lot of love! Our menu plan swaps grilling out for slow cooker comfort foods. Lots of stew, soup, and chili. I tend to use my crockpot for a lot of dinners, but don't forget about dessert! I wanted to make something warm and cozy – a dessert perfect for warming up after playing outside in the crisp, cool air. Plus, I wanted something my daughter could help me make. 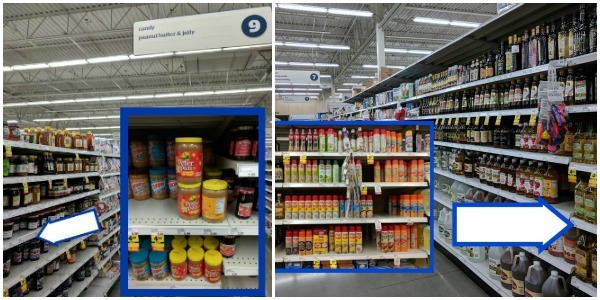 So, we headed to Meijer for our weekly grocery shopping trip plus a few extra items. One of the things I love about this recipe (besides how good it tastes) is how easy it is for the kids to help make it. The ingredients and steps are not overly complicated. It gives them a chance to practice measuring. 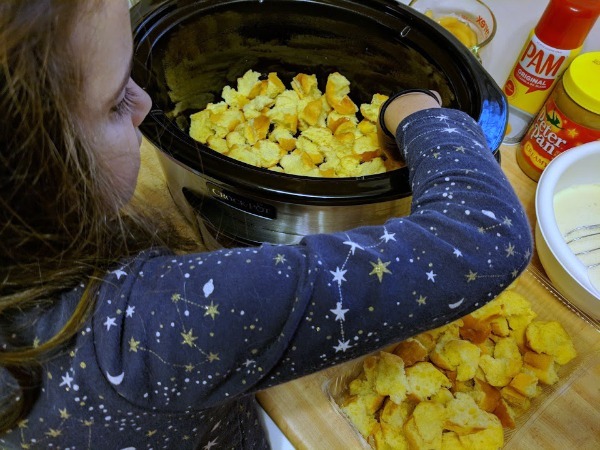 Adding everything to the crockpot is simple and makes them excited to help eat it later! We chose to make this as a tasty fall dessert, but you could make it for brunch too. Before you head to Meijer and shop for your ingredients, make sure to clip this Peter Pan® mPerk: $0.50 off 1 Peter Pan® Peanut Butter 15-40 oz. by 11/11/17. The day before making this recipe, tear apart the Brioche rolls or loaf of French bread and leave them out to get stale. My rolls were fresh, so after pulling the bread apart in rough cubes, I spread them out on a baking sheet. I popped it in the oven for about 5-8 minutes at 325 degrees Fahrenheit. The kids can easily help you rip the bread apart! Crack your eggs into a medium mixing bowl and whisk together with half & half, brown sugar, vanilla extract, and almond extract. 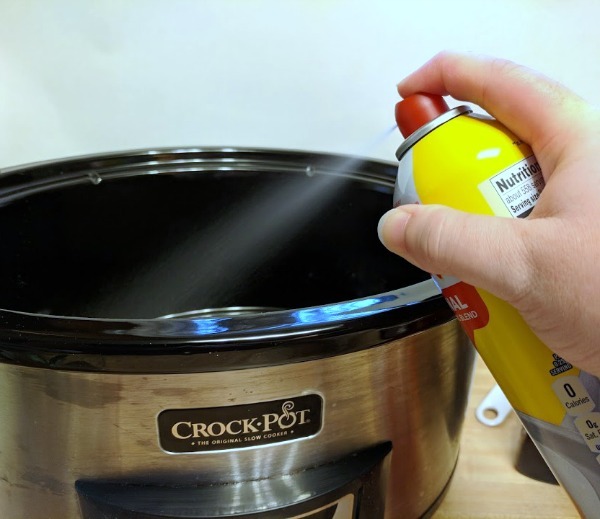 Use your PAM Spray to coat the inside of your crockpot. I love PAM Original Spray and they now have new PAM Spray Pumps available too. PAM Spray Pumps let you control how much you use and the superior non-stick cooking experience of PAM makes clean up a breeze! Put all of your pieces of bread into the crockpot. Pour the egg mixture over the bread pieces. Stir everything around to ensure the bread chunks are covered and soak up the egg mixture. Add the apple pie mixture and gently mix in. 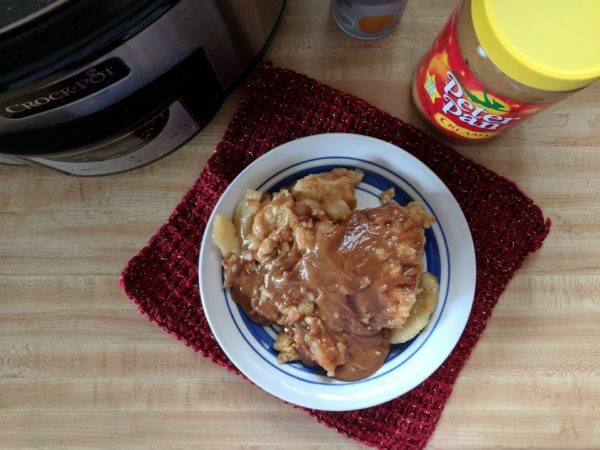 Once the apple pie bread pudding is done, it's time to make the warm peanut butter sauce topping. Yuuuum! I love love love peanut butter and while Peter Pan® Peanut Butter tastes amazing straight from the jar, it makes a tasty ingredient too. Add peanut butter to a small sauce pan with pure maple syrup over med-low heat. Stir frequently until completely melted and bring to a simmer. Let simmer for a few minutes, then mix in butter. 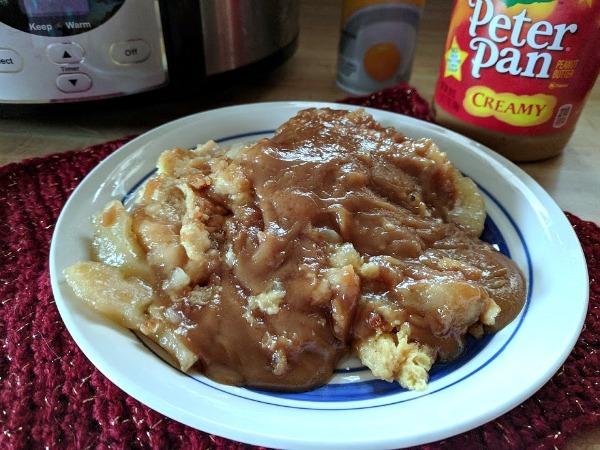 Pour it over the apple pie bread pudding and get your fork ready! Find more crockpot recipe inspiration here! 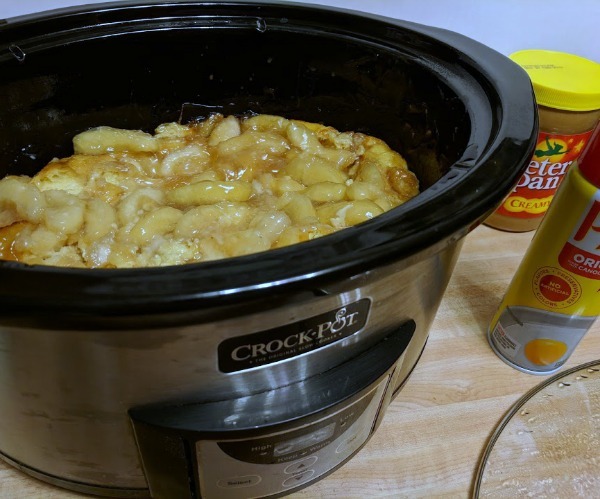 We hope you enjoy this fall dessert made easy in the slow cooker. 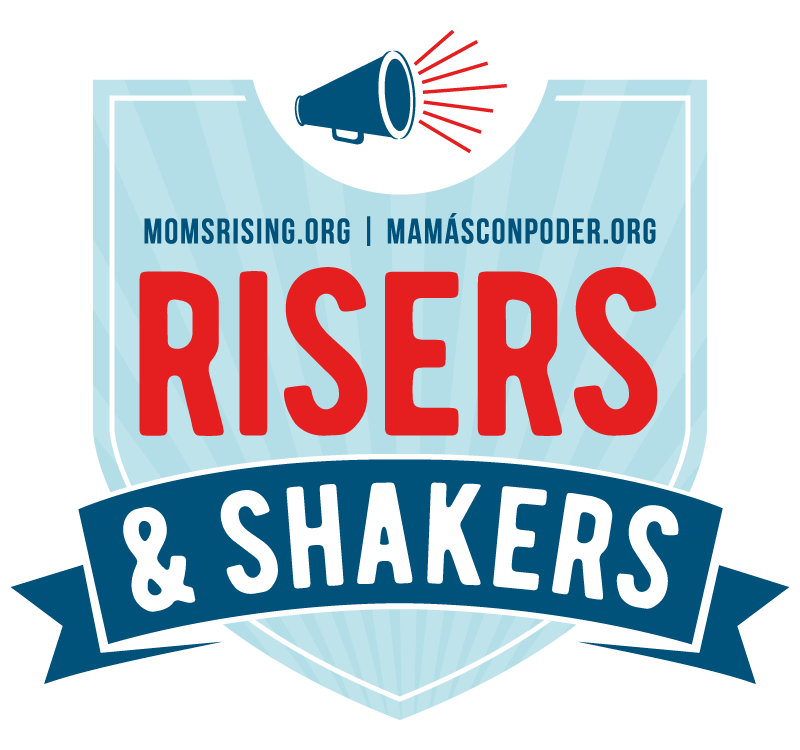 Make it a family activity and enlist your kids to help you prepare it. Use your PAM Spray to coat the inside of your crockpot. The new PAM Spray Pumps are now available let you control how much you use and the superior non-stick cooking experience of PAM makes clean up a breeze! Melt Peter Pan® Peanut Butter in a small sauce pan with pure maple syrup over med-low heat. Stir frequently until completely melted and bring to a simmer. Let simmer for a few minutes, then mix in butter.